PS. My very first Can't Live Without It post I blogged about this shirt and yay for you because now it's on sale! I promise it won't disappoint! Link up with Cait, Steph and myself and tell us what you can't live without! Grab the button and link below! Have a wonderful long 3 day weekend!! Oh I am all about number 3, I love a v neck especially since I wear a necklace daily. I live in tees now (I've been going for the darker colors to hide away the baby food stains, etc). these are fab! I couldn't agree more! My favorites come from a variety of shops. V-necks, definately a number one on my list. I always have a couple on hand to. Pair it with jeans and sandals for a nice summer evening outfit. Have a great weekend. I love a white tee. I have way too many, but my problem is I'm a disaster in white. I usually stain them somehow, which now is so much easier to do with a handsy baby. Lol. I'm diggin the slouchy-ness of #7. Have a great weekend! I love #5 but can't justify the price. I need something in the $10 price range. Oh, love this! I'm a v-neck girl. I found the perfect T at J. Crew a few years ago, but it's different now. They have some good ones at Nordstrom Rack too that I love. Might have to check out a few of these! For me, it's a gray tee... I have so many, yet always finding myself buying more haha! Hello my name is Amy, and I am a fellow gray addict. You can never, ever, ever, ever have too many classic white tees! A great wardrobe staple! First time linking up and so happy I did. 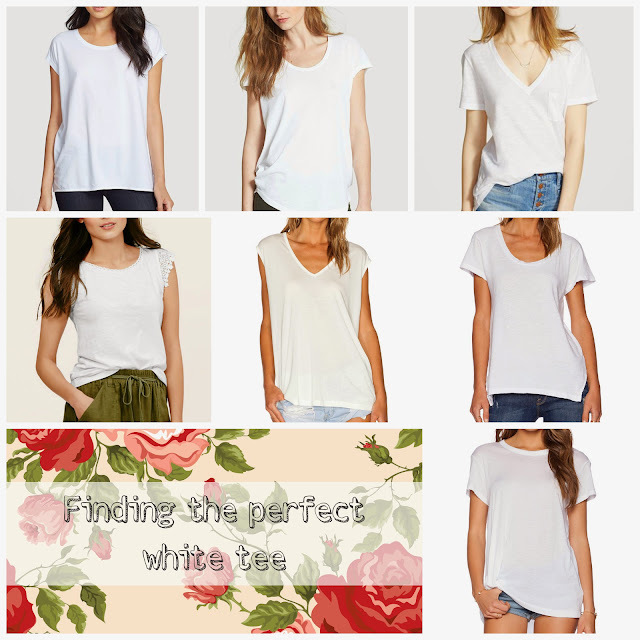 I absolutely adore a white tee, it is a staple in my wardrobe for sure :) Love that you can dress it up or down.